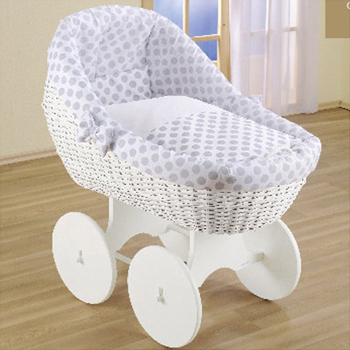 Our Baby Bassinets and Cradles are the Next Best Thing to Mommy's arms. 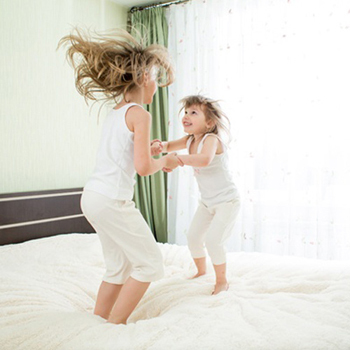 The world of bassinets and cradles is a world where dreams develop, dreams soar, and dreams come true! 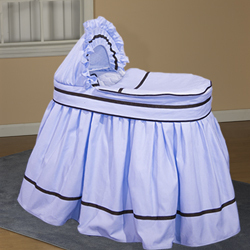 The sight of a precious new life resting in a most beautifully bedded bassinet or skillfully crafted cradle melts hearts and stirs emotions. 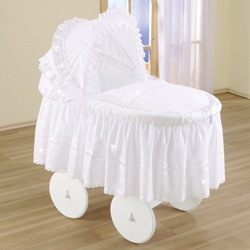 So just close your eyes and begin to imagine … Let your imagination soar as you dream of a magnificent bassinet or royal cradle – with your own beloved little one safely ensconced within. 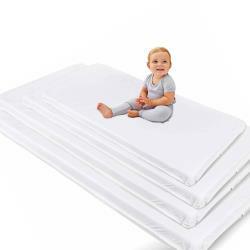 Here at aBaby.com we make those dreams a reality! 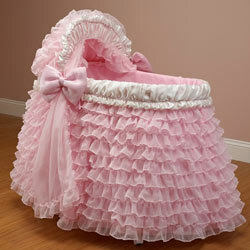 Our wide ranging selection of bassinets and cradles would be overwhelming if it weren’t so breathtaking. 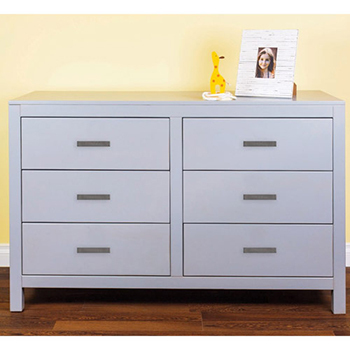 Browse our category and let your eyes feast on one masterpiece of design after another. 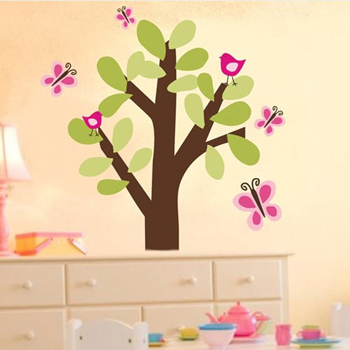 We have the perfect something to satisfy the most discerning mom. Our bassinets run the gamut from classic wicker bassinets with stand and designer bassinets to hospital bassinets for maximum hygiene. If you’re thinking about bassinets dressed in beautiful bedding of liners, skirts, hoods, and veils, you’ve come to the right address! 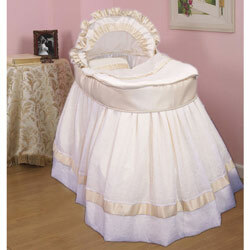 For starters, we offer bassinets for girls, bassinets for boys, and neutral bassinets for generations of use. 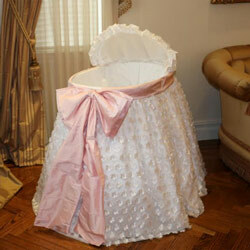 We have bassinets fit for a princess complete with layers of lace, sateen ribbons, and intricate embroideries. 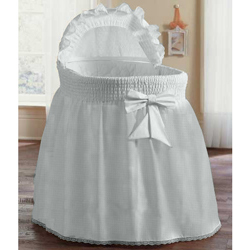 We have organza bassinet bedding, toile bassinet bedding, silk bassinet bedding, and of course the all time classic gingham bassinet bedding. 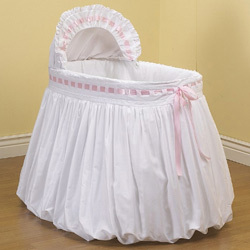 We offer bassinets with long skirts and bassinets with short skirts. 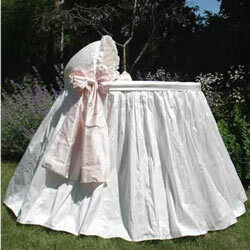 Satin bassinet skirts with sumptuous bows and ruffled hoods make a lovely nest for your feminine beauty. We have bassinets created from detailed eyelet fabrics, as well as shining brocades. 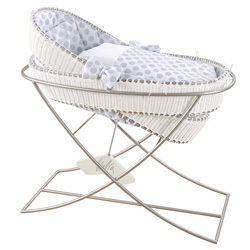 For the modern minded mom, we’ve got hip bassinets to catch your eye and take center stage. 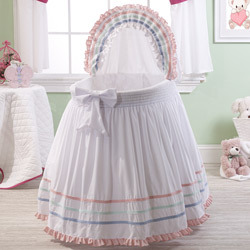 We’ve got pleated bassinets and bassinets with stark color contrasts. On to cradles! 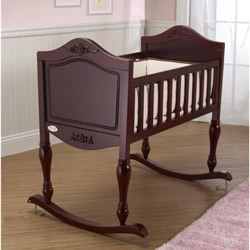 We’ve got wooden cradles by leading manufacturers including Angel Line, Bratt Décor, DaVinci, and Green Frog Art. 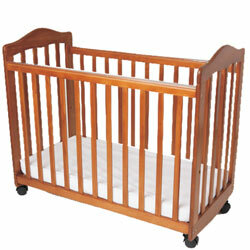 Our wooden cradles are available in a variety of finishes. 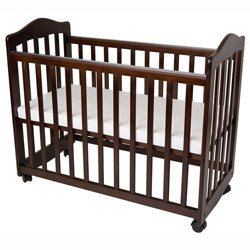 So just choose from natural, oak, mahogany, black, or the others, and you’ve got a cradle to match any décor! 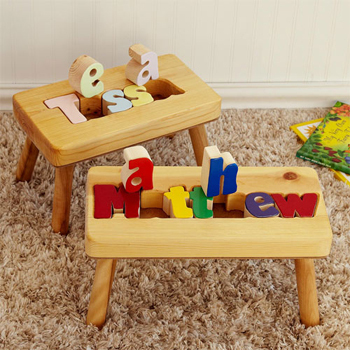 We have cradles with intricate wooden carvings and detailed hand painted designs. 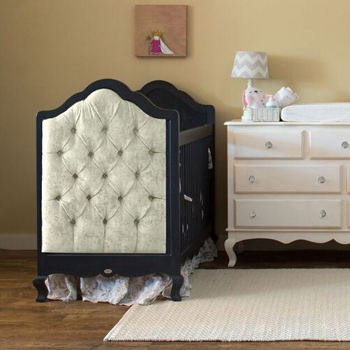 Styles range from antique to contemporary and modern, so let your mind wander as you settle on the cradle that’s perfect for you! 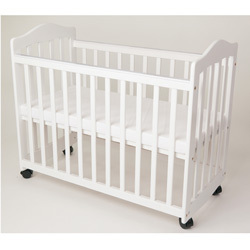 We’ve even got eco-friendly and organic cradles for the nature conscious mom. When you think iron cradle – you cannot even imagine how many options lay before you! 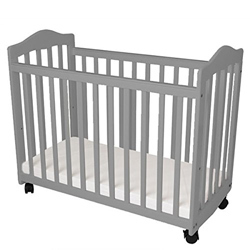 With Corsican’s best iron cradles we offer oval iron cradles, scalloped iron cradles, rectangular iron cradles, and iron cradles with posts for veils or canopies. Each exquisite creation is a world of its own. 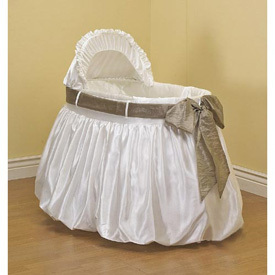 No matter if you like a sleek graceful look, or prefer a grandiose creation with full skirts and veils, we’ve got it all – right here at aBaby.com. 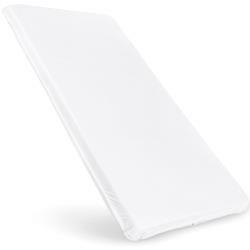 aBaby.com – The final word on baby’s first bed!